A musical proto-brain, an Alzheimer Symphony and the rise and rise of conceptualism in dance constitute food for vigorous thought in this e-dition. But a real no-brainer is the necessity to rigorously protest the Turnbull Government’s brutal depredation of Australia’s complex, highly effective but extremely vulnerable arts ecology. Artists and supporters are now mobilising to demand the return of Catalyst funds to the Australia Council and a return to the status quo—a single federal arts funding body insulated from ministerial interference. Labor (yet to announce its election arts policy) has promised to return unspent Catalyst funds, the Greens all of them. The big challenge for artists is how to convince voters of any persuasion of the extremity of the crisis and how it will sooner than later affect them too. We can endlessly recite figures that prove what this government ignores—the substantial jobs’n’growth and innovation which art generates. For all that, the arts and, unbelievably, creativity have not figured in Turnbull’s policy announcements. The issue is principally ethical: the Government and Arts Minister Fifield’s treatment of the arts has been dictatorial, disrespectful, divisive, non-consultative, secretive and opportunist—in a word, un-democratic, not least in its plundering and diminishing of an independent statutory authority, the Australia Council. The moral case has to be put, that a government that does not believe in the integrity and creativity of artists cannot be trusted by Australians as valuing art. Prime Minister Malcolm Turnbull can only gain the trust of voters by returning to the funding status quo. Beyond protest we all need to think big about the place of the arts in this country. At a “town hall” meeting, titled Let’s Talk and presented at The Gunnery in Sydney by NAVA and Artspace on 30 May, anxious and angry artists and artworkers bristled with strategies for convincing the electorate of the need to return Catalyst funding to the Australia Council. There was an unfortunate degree of self-laceration, that the arts has not strongly represented itself to governments over recent years. However, it had to be acknowledged that the enormous collective energy expended in 2015 in protesting the Brandis-Fifield depredations, the writing of a remarkable 2,500 or so submissions to a Senate Enquiry on the subject and extensive media coverage of the Free the Arts campaign revealed the potential strength of the united front presented by Artspeak, Feral Arts, Theatre Network (VIC) and other organisations and thousands of artists from across the country. Not so long before, the arts community had advocated for and contributed significantly to both the Australia Council review (2012) and the Labor Government’s Creative Australia: National Cultural Policy (2013), both of which laid foundations for continuity and development, if within the limits of vulnerability to changes of government, ideological fixations and absence of bipartisanship. Perhaps we believed that tinkering with the structure of the Australia Council and urging the implementation of a cultural policy—with art at its core, alongside generalities about the value of culture—would be our salvation. Meanwhile peer assessment and contribution to Australia Council policy-making was steadily being eroded, transformed into a mysterious three to four level hierarchical assessment model applied to four-year funding applications. If artists cannot dialogue with and contribute to policy with the Australia Council, how can they even begin to engage with government? The Australia Council Charter requires peer assessment, but it has been weakened and ignored and needs to be seriously re-visited. But within what larger context? If the arts indeed do constitute an ‘industry,’ then we need to be treated like one and consulted by government as they do other industries. This is where we need, from the bottom up, to think big so that, instead of waiting for a Whitlam or a Keating or even an arts-championing Crean to come along, we embed a safe but progressive place in government for culture. It could take a while, but the notion has been strongly argued for. Of course, such a Ministry of Culture would only work if it was a cogent assemblage of independent statutory authorities championed by their Minister. Were it not for examples of such ministries in other countries—with South Korea an exemplar and regional inspiration—you might think Pledger and Schultz naïve utopians. You might object that art could get lost in such a ministry. You might also baulk at the inclusion of sport, but perhaps not science given the ideological thrashing dealt its facticity and creativity by a neo-liberal government. But sport is integral in how many Australians imagine themselves, white and Indigenous. And we make art about sport. Not explicitly on Schultz’ list but worthy of inclusion are the creative industries. 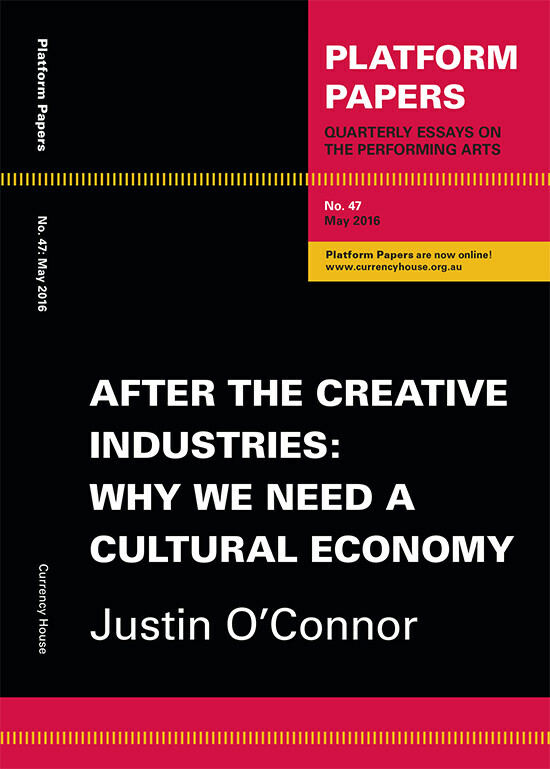 To understand the relationship between the arts and the creative industries, you should read Justin O’Connor’s impassioned, nigh apocalyptic “After the Creative Industries: Why we need a Cultural Economy” (Platform Paper, No 47, May 2016). If Pledger delineates Neoliberalism’s radical devaluing of the artist, O’Connor targets its role in eroding the notion of public value (in health, education, the arts…) and of the citizen. He describes the failure of UK and Australian governments to run with the creative industries they so keenly adopted but in the end expected to be entirely self-monetising, in the process making a travesty of ‘creativity.’ At the same time, Neoliberalism’s managerial virus invaded the arts ecosystem, infecting creativity and risk-taking with numbing degrees of accountability. The virus has been injected into the CSIRO, another independent statutory authority being run down, this time by a former venture capitalist and physicist, Larry Marshall, eager to abandon data collection-based research for money-making applications of previous research. As O’Connor sees it, culture, the arts and creative industries are all under threat when creativity “can easily be translated into no more than a production input” and then culture loses its meaning. The cultural and creative industries divide, he argues, “is a false distinction and divisive,” “sneak[ing] in all sorts of old hierarchies.” Both are prey to Neoliberalism and giant content-capturing techno-corporations. Alarmingly, O’Connor worries that “if the creative industries sink they will take down the arts with them,” presumably because the arts are increasingly technologies and also content-ripe for technological and “fair use” copyright exploitation (about to accelerate if Productivity Commission recommendations are adopted by the Government). The arts increasingly appear on and are made for the everyday technological devices that deliver what is experienced and understood as culture—private rather than shared. O’Connor fears “the wholesale privatisation of culture with government acting as an infrastructure provider and or consumer protection regulator.” Is it then an ironic blessing that Turnbull left the arts out of his innovation and jobs’n’growth policies? O’Connor does not indicate how this discussion might take place nor the political or structural outcomes he has in mind. How would he feel about a Ministry for Culture argued for and shaped through public debate and consultation between culture makers and government? Will we be comfortable with the term “cultural economy” in such a discussion, given the evils done in the name of economics? Justin O’Connor’s Platform Paper is an exhilaratingly angry if often depressing read, offering insights into the tectonically shifting semantics of culture, art and creativity across some five decades and their ramifactions. Read it now, while it’s hot and utterly timely. When the art community came together in a show of strength in 2015, the promise of a mostly united arts community bloomed; now that many major performing arts companies and galleries have emphatically joined the protest there is a sense of communality, of shared responsibility to a complex ecosystem. In coming weeks, ArtsPeak and others will announce a range of strategies you can engage with beyond your own letter writing, emailing and tweeting. We’ll keep you posted. 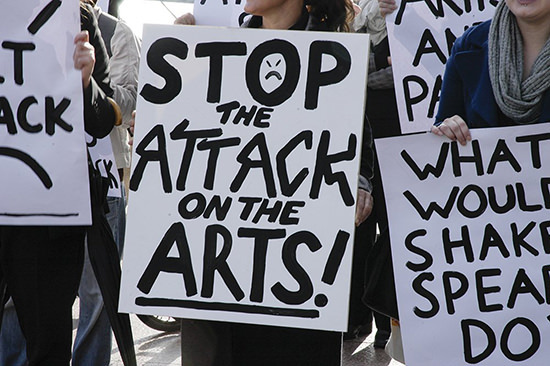 The fight to protect the arts is part of a larger battle against Neoliberalism’s pervasive devaluing of artists, culture and the public good, all of which have been reduced to economic outputs and consumer preferences. We need a vision that is not merely a rear-guard defence against ministerial incursions and funding cuts, but one which creates an enduring space in government and the minds of all Australians for culture.